Over the last few months we’ve been holding a series of talks at the Guardian for staff around the theme of “digital”. Recently it was the turn of Benji Lanyado, who has made a name for himself as the Guardian’s travel writer who goes on #TwiTrips. He arrives in a city, and then relies on people tweeting him with tips and directions to find hidden gems and the things that the locals recommend. 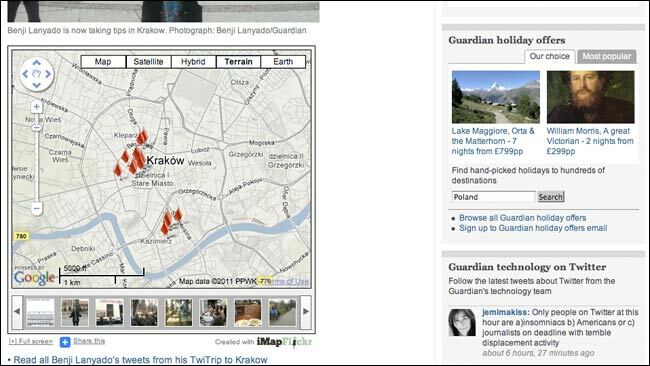 One of the challenges that Benji faces is how to represent the unfolding day on the Guardian website. One way would be to write a live blog. That involves using a CMS which is not optimised for mobile usage. Instead Benji embeds third party apps like ScribbleLive or iMapFlickr into a page. He can do this because we have an “embed object” ability, which allows a journalist to embed raw HTML into our pages. This, of course, carries risks. 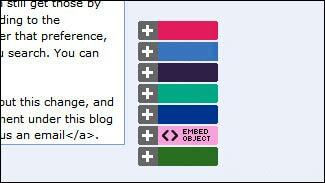 Effectively it means that any member of our production teams can embed any arbitrary code on our pages. There are scary security and performance implications. In fact, from a purist technical architecture point of view, you’d rather people couldn’t do it. However, I think it is important that they can. It means that any of our journalists can experiment with any new tool that appears on the web which allows embedding. The instant it appears. No waiting around to see if we want to integrate, or having to prove that it works before getting permission to put it on the site. Just insert the object and get on with experimenting with new services and digital journalism. When services get popular and we find them being used a lot, then we’ll look at providing a more integrated component. We do that now with Twitter, and you’ll see that embedded all over the site in units we’ve specially designed for the purpose. 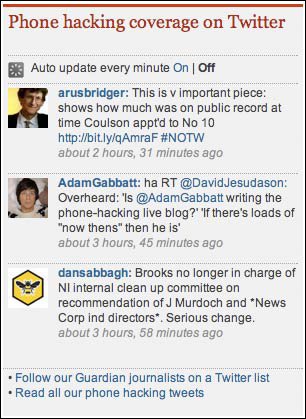 But then, you’ll also see people embedding Storify, because at the moment that seems like an easier way to curate a collection of Tweets than the components we’ve currently got. This embedding method does raise a question of digital permanence though - a topic I’ve written about several times. Benji follows up the Twitter trip with a more traditional article that is a write-through of what happened on the day. 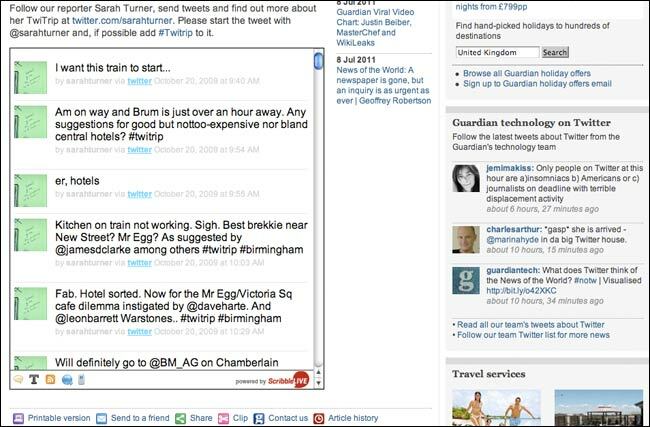 This, for example, is the London TwiTrip live, and this is the write-up. These can be a little production intensive, because he wants to make sure he links to everyone who gave him tips during the day. This is the main record of what ends up in our database and available via the Open Platform API and site search. The page featuring the embedded third-party tools however, will just be a jumble of HTML, that may last forever, or may break if a third party makes changes to their embed code, loses the data, or goes out of business. The other main technical issue affecting the Twitter trips appeared to be battery life. Benji usually carries a couple of auxiliary smartphone batteries with him, and still often has to stop for a recharge. Poor 3G signal and international roaming charges for data are also a pain at times. Benji spoke a little bit about user expectations of the trips. The audience seem to tolerate less-than-perfectly shot video and crackly audio because “the slight crapness” gives it authenticity. This isn’t a glossy travel show on TV, it is one man with a smartphone. At the moment, he said, users seem very forthcoming with the tips, and still enjoy seeing their name mentioned on the website. He stumbled upon the concept when he had a few hours to spare in Berlin in the early days of Twitter, and a somewhat random plea saying “I’m on the corner of so-and-so and such-and-such, what should I do?” prompted loads of replies, leading him to a gem of a coffee shop. And of course, this being the media world where no good idea goes uncopied, Benji has spawned imitators in Hong Kong, Australia and the US. Perhaps they could all get together and do a unified TwiTrip in a city for a day? By Martin Belam on 11 July 2011. Cheers for the post Martin. Yup, our ability to embed HTML into pages is very handy indeed. Was chatting to an online guy from the BBC about how difficult it is for them to do the same, as any new third party software has to be properly vetted and tested, and has to go up and down a few chains of command. What a ballache. Tis *not* the way to operate in this brave new world of journalism, methinks. Experiment! We have recently lost the ability to post raw HTML on pages (it's now reserved for only a handful of developers), which is a little frustrating, but it may turn out that the increased workload on them sees a change in thought. I hope so.